Being Retro: Doctor Who Knows, Do You? I know a couple people who are going to go nuts for that shirt. I never got into Dr. Who though. Now, do one for say Stargate SG1, and I'd be all over it! I'm a new convert to Dr. Who. Couldn't get into the earlier version, but the last few years, oh yeah! 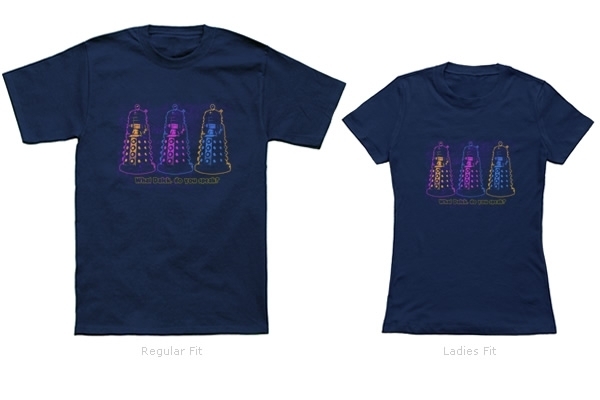 Love your Shirts!I found Doctor who on PBS in the early 80'S. It was difficult to find stuff in the US, everything had to be special ordered videos & books. Tom Baker was my first Doctor ,so he was the one I kinda grew up with. I love the NuWho, and the fact that I can go to my local comic book shop and find a plethora of stuff. I could possibly fill your whole post with my comments so I will digress. Yet to see the new guy in action, so my thoughts are yet formulated. I love the colors in that shirt man. This is going to be an interesting season. Most of my friends love Dr. Who I have been feeling left out lately. I may be checking out some seasons soon. I have a friend who is a lecturer on media. He's a big Dr. Who fan and goes to a lot of Dr. Who conventions. His house is full of actual memorabilia from the show. He has also met a number of the guys who played Dr. Who. Do you guys get "Torchwood" in North America? The spin-off show of Doctor Who. "Torchwood" is an anagram of "Doctor Who." A good weekend to you.